One of the dirty open secrets about “the land of the free” is that, here in America, we have more people in our prison system than any other country in the world. Here’s the numbers: as of 2010, there were 2,267,000 people behind bars in America, with 4,934,000 additional Americans on probation and parole. Fourteen million Americans are “former felons,” who will be handicapped for the rest of their lives with difficulties in being hired or receiving government assistance such as grants or loans for schooling, not to mention the shackles on their minds that all too often from a stint in prison. The good ol’ USA is way out in front of the number two imprisoner of human beings–Russia. 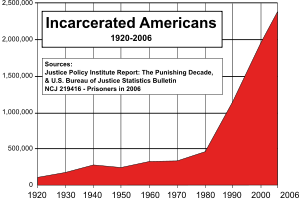 The US incarceration rate in 2009 was 743 per hundred thousand, fifty percent ahead of the Russians and Rwandans, both of which clock in at around 560 per hundred thou. By contrast, only 71 out of every hundred thousand Norwegians is imprisoned. In Holland, where legal marijuana sales should , according to the DEA, have precipitated a massive crime wave, the incarceration rate is 94 per thousand…hey, maybe they’re just too stoned to bother arresting people….or too high to go out and commit crimes? And, when Republicans say they don’t want America to be like Europe, is this what they’re talking about? Is this really a field in which we want America to be “number one”? Ooh, but aren’t we keeping hordes of violent criminals off the streets? No, not really. About eight percent of the roughly two hundred thousand people in federal prison are there for violent crimes. That’s about sixteen thousand people. About half the roughly 1.3 million people in state prisons are in for violent crimes–that’s about 650,000 people. And approximately a fifth of the three-quarter million individuals in local jails are there for violent crimes–that’s about a hundred and fifty thousand people. When you add it all up, that’s slightly over a third of all prisoners locked up for violent crimes, about 816,000 out of roughly 2.25 million, with two-thirds of those in jail, about one and a half million people, locked up for non-violent, frequently “victimless,” crimes, at a cost to taxpayers–that’s you and me–of around thirty-six billion dollars a year.